The HSD Research & Development department has designed a RIGHT ANGLE HEAD with "C" ARCHITECTURE for milling the underneath of the panel. This Aggregate Head drastically reduces the working times, including localized "blind" machining under the workpiece, by avoiding the turning of the panel. • Increased PRODUCTIVITY, as the work is being carried with the panel in one position. 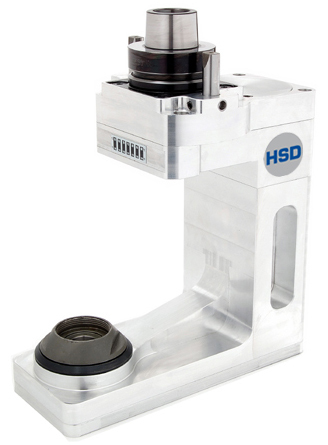 • Increased FLEXIBILITY on both sides of the panel, thanks to the option to mount bits of various diameter and end mills in the ER16 collet mounted on the output shaft, making the aggregate particularly suitable for machining lock and hinge housings as well as rebates and various types of holes. • Larger machining perimeter on the underside of the panel of 115 mm (the entire face of the panel is reachable by the collet). The use of a dual belt transmission system allows the output shaft to have an offset in Z and in X that allows the aggregate to machine panels/uprights of up to 80 mm thick (with a bit of maximum length 25 mm) to a maximum depth of 115 mm. The overall rigidity of the system is guaranteed by a heavy "C" structure machined from solid sheets of Ergal, suitable stiffened and hollow machined to provide a perfect balance between lightness and the necessary rigidity. The ground WC/C tungsten carbide anti-wear coated gears, the casehardened shafts and the high-precision bearings allow the high tool rotation speeds required for the machining operations described to be reached.